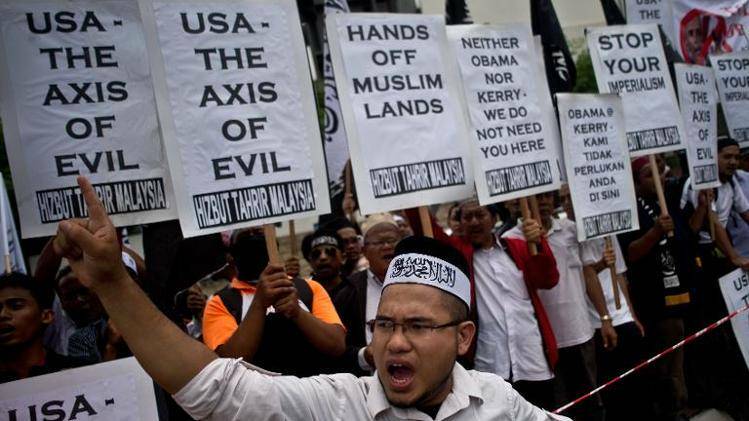 JNN 25 April 2014 Kualumpur : Malaysian Muslim activists have protested outside the US embassy against the upcoming visit by President Barack Obama, denouncing him as an enemy of Islam. The demonstration underscored the delicate nature of Obama’s trip to Muslim-majority Malaysia, which will make him the first sitting US president to visit in nearly half a century, a period marked by mutual distrust. Malaysia has opposed US wars in the Middle East and supports the establishment of a Palestinian state. Obama embarks on a week-long Asia tour next week that will bring him to Malaysia April 26-28. The last US president, who visited Malaysia, was Lyndon Johnson in 1966. US-Malaysia relations have been marked by bitterness in recent decades, particularly during the tenure of former authoritarian premier Mahathir Mohamad from 1981-2003, who was harshly critical of US policy around the world. Current Prime Minister Najib Razak has taken a more friendly tone toward the West, but he is restrained by conservative elements in his Muslim-dominated government. Obama will also visit South Korea, Japan and the Philippines at a time of unease around the region over China’s rise. Police armed with truncheons, shields and a fire hose clashed Wednesday with more than 100 left-wing activists who rallied at the U.S. Embassy in Manila to oppose a visit by President Barack Obama and an expected security pact that would increase the American military presence in the Philippines. Riot policemen blocked the flag-waving activists near the heavily fortified embassy compound but the protesters slipped past them, sparking a brief scuffle in view of motorists stuck in traffic. Obama arrives in Manila on Monday for an overnight stop after visiting Japan, South Korea and Malaysia on an Asian trip in which he is expected to reassure allied nations enmeshed in long-running territorial disputes with an increasingly assertive China. The United States and the Philippines, which are treaty allies, have been scrambling to overcome differences to finalize a new security accord in time for Obama’s visit. The accord would allow more U.S. troops, aircraft and ships to be temporarily stationed in selected Philippine military camps as a counterweight to China and as a standby disaster-response force. About 500 American soldiers have been based in the southern Philippines since 2002 to provide anti-terrorism training and intelligence to Filipino troops battling al-Qaida-linked militants. This entry was posted in Asia Pacific and tagged Asia Pacific, Barack Obama, Kuala Lumpur, Malaysia, Manila, obama, Protest, Protesters. Bookmark the permalink.